Documents relating to some six million soldiers who served in World War I were retained after the war. During World War 2 the store in which they were kept was hit by enemy bombing and some two-thirds of the records were destroyed. The rest were badly damaged by fire and water, but were nevertheless retained. During the 1990s with the help of funding from the Heritage Lottery Fund the painstaking job was undertaken of trying to retrieve as much of the information as possible from these documents. The result is the series of so-called Burnt Documents, which are available for consultation on microfilm at the National Archives at Kew, although, by subscription, can be viewed using online sites. Wherever possible, reference has been made these surviving papers to document the Service History of the men named on the Buxton Memorials. The Commission, as part of its mandate, is responsible for commemorating all Commonwealth war dead individually and equally. To this end, the war dead are commemorated by name on either a headstone, at an identified site of a burial, or on a memorial. 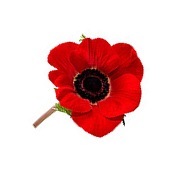 War dead are commemorated in a uniform and equal fashion, irrespective of military or civil rank, race or creed. CWGC logo in the top right corner of his/her page. and graves, plus many details from War Diaries and Official Regimental Histories. two sites to provide me with the relevant photos of graves and memorials. of a poor standard, however, it was felt that better a poor photograph than none at all! such as 'The Sphere' or 'War Illustrated'. Let Those Who Come After See To It That Their Names Are Not Forgotten. 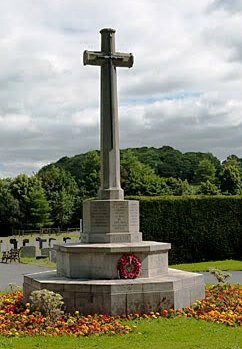 "More Than Just A Name"
Welcome to this website commemorating the men and women from the town of Buxton, Derbyshire, who served and died in the two major wars of the 20th Century. Predominantly, on the Centennial Anniversary of the outbreak of the Great War, 1914 - 1918, emphasis will be on those who gave their lives in that conflict. For interests of privacy, of living direct relatives, less detail is included on those who died during the Second World War, 1939 - 1945, although a recently published book (see below) contains a lot more information than this site. Since starting research for this site events of more recent conflicts have seen new names added to the town's main Memorial. The main aim of the site is a simple one, and that is Remembrance. By building this website I hope to perpetuate the memory of the men (and one woman) of the town who lost their lives in the service of their country. The theme of "More Than Just a Name" unashamedly takes its inspiration (and with permission) from John Hartley's superb website "Stockport Soldiers who died 1914 - 1918" - the intention is clear, our local heroes deserve a greater recognition than "just a name" on the Memorials, rarely read and thought of. To this end it has been my great honour to visit and pay my personal respects to the graves and memorials of over 80% of those commemorated on the Buxton Memorial. To this end I have to give my thanks to my wife, Jane, who has read maps, taken photos and travelled down many a muddy track to help me achieve my goals. The original idea behind the website was a simple one, and that was to positively identify, by name and regiment or unit, each of the men listed on the war memorials in the town. In addition, however, more detail has been added about where they were born; what jobs they did, and most importantly the families they left behind. As far as is possible details are also given of when and where enlistment took place, and what engagements took place for each man, including, of course, the one where the ultimate sacrifice was made. The results are interesting - Why are there so many men from Canadian Battalions? Why are some names there for whom no records exists? How come two names are of men who survived the War? Navigation is simple: the buttons on the left link to the individual Memorials in the town; those above are to search for individuals by surname. Each name links to an individual page where Personal and Military history sections tell you as much as I have found about each man, including a photo, where possible. 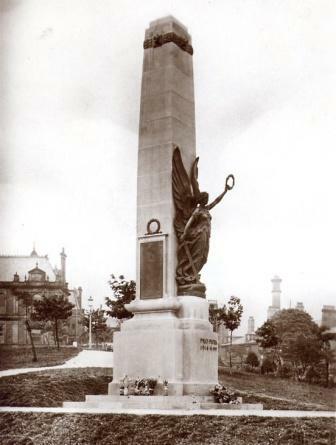 Buxton's main War Memorial is a magnificent 8 m. high Sandstone Obelisk, adorned with a carving of a Winged Victory, standing proudly overlooking the town on 'The Slopes'. It was unveiled on the 18th September 1920 and displays three bronze panels bearing the names of 315 men and 1 woman who gave their lives in the Great War. At the end of the Second World War another panel was added for those who gave their lives in that conflict. However, as with many towns, the former outlying villages - now suburbs - have their own Memorials, often as separate structures and/or included in parish churches. Add to those Memorials at workplaces, schools, in streets and attached to buildings, the town has a rich and varied number of Memorials to commemorate its War dead. the town during both Wars. and Palace Hotels, among others, were designated Canadian Hospitals. If you have any further information that you would be willing to share about any of the individuals commemorated on this site - please email me at the address shown on the left. N.B. There is not a direct link from the image. Just type the address shown in the usual way.